St. Louis Blues keep rolling despite quiet deadline. Lost amid the excitement and drama that represents the annual NHL Trade Deadline are the teams that didn’t make a move. For whatever the reason, some teams are unwilling or unable to pull the trigger on a deal. The St. Louis Blues were among those clubs this past deadline. Although on the surface, ownership uncertainty played a major role in their deadline inactivity, could there be another, less obvious reason? The Blues currently sit two points back of Vancouver for first overall in the league. The crew from St. Lou have very quietly gone about their business, and their efforts have them sitting first in the Central Division. Their most recent conquest, a 3-1 win over the Calgary Flames Feb. 27 has them rolling, going 9-3 in their last twelve games. It was apropos that their latest victory came on the evening the Flames honored former blueliner Al MacInnis, the Hall of Famer who also suited up for the Blues. The St. Louis Blues have become a remarkably good team under coach Ken Hitchcock. What’s more remarkable is that very few outside of St. Louis are aware of this. They have put together a fine mix of youth and experience. 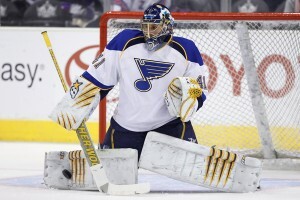 They have added two fantastic goaltenders in the last three years in Brian Elliott and Jaroslav Halak. They have bought into Hitchcock’s system, and all these ingredients have the Blues flying high. While teams were climbing over themselves trying to outbid each other, sometimes the best trades for a team are the ones never made. The Blues have a chemistry that should be the envy of every other team. This team believes in itself, and never goes into panic mode, as evidenced by their response when Calgary opened the scoring last night on their very first shot. A very calm and cool counter attack erased the deficit and propelled them to yet another victory. Now the Blues sit atop the Central Division, tied with the Red Wings for points, but ahead of them by virtue of two fewer wins. As previously mentioned, they sit two points out of first overall in the league. The Blues look to be a serious contender, and they seem built for the playoffs. They are not relying on one or two stars to lead them, but all support each other on and off the ice. There is reason to believe in St. Louis this season, and this team appears to be a threat for any playoff opponent. Of course, the playoffs are a different animal altogether, but if Hitchcock has as much pull in the room as he appears to have, he will have this team ready for the two month marathon to Lord Stanley’s Cup.